Chhattisgarh Board 12th Vocational Result 2019 - Chhattisgarh Board of Secondary Education (CGBSE), Raipur will announce the CGBSE Vocational Result 2019 soon. The CG Board 12th Result 2019 will be one of the most awaited events after the Chhattisgarh Board 12th vocational exams are conducted. As per the timetable released by the board, the exam will commence from March 2, onwards, and will end on March 29, 2019. With the board exams just two weeks away, students seem to be in an anxious state because of the CGBSE Class 12 Vocational Results 2019 date. 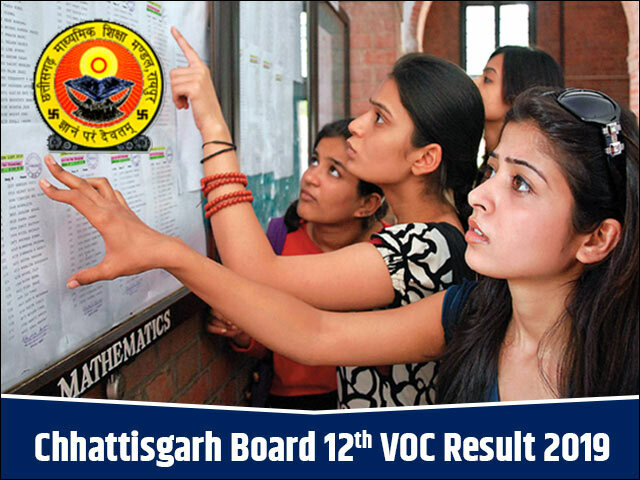 As of now there is no word from the Chhattisgarh Board on the date of CG Board 12th Result 2019, however, industry experts believe the CG Board 12th VOC Result 2109 will be released on the similar timeline as that of last year. In 2018, the CGBSE Vocational Result was announced on May 9. Therefore, students can expect the Chhattisgarh Board 12th Vocational Result 2019 to be declared somewhere in the second week of May. Students awaiting their CG Board 12th VOC Result 2019 will be able to check the same from the official website- cgbse.nic.in. Apart from the official website, the CGBSE Vocational Result 2019 will also be available on this page. JagranJosh will update a link in article for the students to access their result without any delay. To keep themselves updated with all the latest news and developments on CG Board 12th VOC Result 2019, students are advised to bookmark this page and register here with their official email id. As mentioned above, the Chhattisgarh Board is likely to announce the CGBSE Class 12 Vocational Results 2019 soon. After the formal declaration of the results, the scorecards will be available on the official website of the board i.e. http://cgbse.nic.in. With lakhs of students accessing their results online simultaneously, the official website might some technical errors. If such situation arises this year, we request the students not to panic and wait for the official website to resume. Alternatively, the candidates can also visit chhattisgarh12.jagranjosh.com for fast and easy access to their results. We here at JagranJosh understand the amount of pressure and anxiety the candidates go through during result hours; therefore we have kept the result checking process extremely easy and simple. The Chhattisgarh Board is considered as one of the biggest boards in India. The marks obtain in the Chhattisgarh Class 12 Vocational examinations sets the tone for the candidate who wants to pursue higher education. A good score in the CGBSE 12th Result 2019 will help them to face future competitive examinations. As per the previous year trends, the CGBSE 12th Vocational Result 2019 is expected to be out by second week of May, 2019. For now students can go through the previous year stats to get a hang of the difficulty level of the board exam with the help of overall pass percentage of Girls and Boys. What after CGBSE Vocational Result 2019? The candidates who are eagerly waiting to grab their results once they are announcement should note that the Chhattisgarh Board will not issue the original mark sheet immediately after the formal declaration of the CGBSE 12th Vocational Results 2019. Therefore, it is extremely important for the candidates to download the PDF file of the results and take some printout of the same for future references. The candidates can produce the photocopy of the result during the time of admission. However, the authorities will always ask for the original mark sheets issued by the CGBSE to corroborate the online / printed scorecard before completing their admission formalities. Post the Chhattisgarh Board 12th Vocational Result 2019 are declared, there may be celebration for some while some may be disappointed with their performance in the exam. There are instances where a student may feel he had done better than the scores obtained, in such case he may seek for re-checking/ re-evaluation process that is offered by the Chhattisgarh Board. The r-evaluation and re-checking are important aspects with regard to the CGBSE 12th VOC Result 2019 that a student must keep in their mind. In case the students do not feel that their efforts have been truly justified in the scorecard, they can apply for re-checking / re-evaluation of the answer sheets. In case there is any change in the final mark tally, the same would be updated in the original mark sheet. The Chhattisgarh Board 12th Vocational Result 2019 may bring bad news for the students who do not score passing marks in the CG Board 12th Vocational exams. In such cases, they will be provided with another opportunity to prove themselves. The students will be able to appear for the Chhattisgarh Board Vocational compartmental/ supplementary exam. The supplementary examination is likely to be held in the month of June and July. The same will be notified here in this article and also by the board on their official website. Students are advised to bookmark this page for any update on the CGBSE Class 12 Vocational Results 2019; they can also fill in their details on the link shared in this article to receive notification in regards to the CG Board 12th Result 2019. After the formation of Chhattisgarh state on 1 November 2000, the Chhattisgarh Government School Education Department was upgraded to Chhattisgarh Board of Secondary Education on 20 September 2001. The first board examination was conducted by the CGBSE in the year 2002. The board regulates the academic guidelines for the courses listed below, apart from the yearly state level examinations. The Chhattisgarh Board 12th Result 2016 was announced by the CGBSE board yesterday. Girls emerged on top and beat boys by a significant margin in the CGBSE Result 2016. The long wait of students have fructified today with the declaration of CGBSE 12th Result 2016. The Chhattisgarh Results were unveiled at a brief ceremony at the CGBSE headquarters in Raipur on April 21. In the ceremony, state education minister Kedar Kashyap declared the Chhattisgarh 12th Result public. As per CGBSE secretary Sudhir Kumar, the CGBSE Board has managed to announce Chhattisgarh 12th results well in time this year. Earlier, it was reported that CGBSE 12th Results 2016 will be announced in May. Raipur: CGBSE secretary Sudhir Kumar they shall be announcing 12th result Ton 21st April @10.00 a.m .Exam was held from Feb 23 till March 14. Students waiting for the declaration of CGBSE 12th Result 2016 will be happy to know that the results will be announced on April 21. Post declaration, CGBSE Results will be available on official website www.cgbse.net.